Goofing off to do blister care. 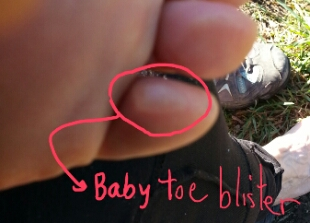 First I had to take care of my blister. Sorry I didn’t keep a good photographic record, but here it is before the sock and shoe went on. It was an absolutely perfect morning to be walking – sunny and cool, with a good dirt path. By the afternoon, the day was warm and the path deteriorated as it went uphill. It got a lot worse than the photo below, and every step required attention. Finally I stopped in Foncebadon, which is conveniently placed for the final ascent (most of it was done today) and then some serious descent (1000 m) into Molinaseca. I’ve discovered 2 more blisters. Maybe I can KEEP them small. 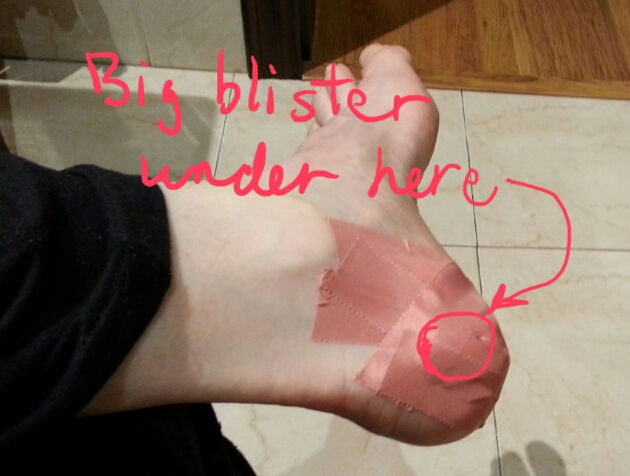 Due to popular demand (1 person asked), I will describe my blister treatment philosophy. Under normal non-camino circumstances, I would not drain, but that doesn’t work when you walk 20 km each day – the blister simply grows with the pressure. So I poke them with a thickish needle, apply pressure to drain, splash on liberal lashings of iodine, smear on antibiotic ointment, apply light covering for the night, and then engineer complex padding and protective structures for the day of walking. Any questions? 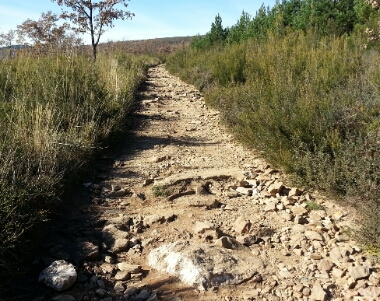 November 12, 2015 in Camino 2015. Please have a rest day to give your feet a chance to heal. Don’t let those blisters get infected or you will be forced to stop!! Seriously. Bus into Ponferrada and take it easy there. Thanks for the wishes. I was thinking I’d take a day off if there wasn’t clear progress in healing each morning. So far, so good. On my first two caminos I suffered with blisters under my fourth toes which were surprisingly painful. This year I took avoiding action and bought some protective gel tubes which I put on every morning and they worked a treat. Not a sign of a blister in this vulnerable area. I am sure you could pick some up in a farmacia along the way. A day off sounds like a good idea. 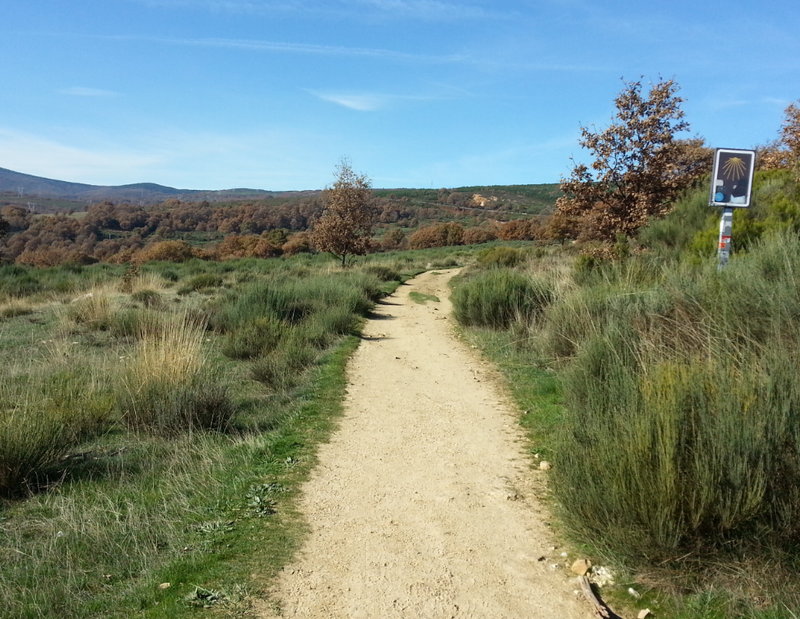 The walk from Santa Catalina to Molinaseca was my absolute favourite day on the CF.